Join our pre-potting program for beautiful containers that will bloom all summer! 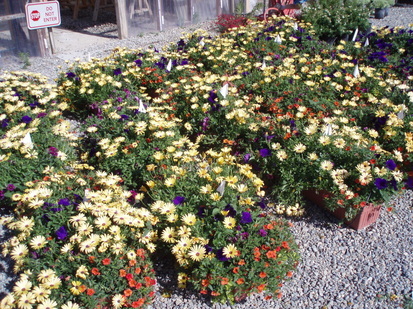 Park City Nursery will grow plants and arrangements specially for you! Our award winning staff will use your specifications or design combinations to create gorgeous pots, hanging baskets, window boxes and unique planters. Sign up for our Custom Flower Pre-potting Program and reserve your greenhouse space early (October/November) - space fills up fast! Service includes staging your pots in the fall, sanitizing them, and storing them for winter. In early spring, pots are planted with a variety of annuals so the plants achieve dramatic length and color before being moved outside. In mid June, after the last frost, planters are delivered and installed in full bloom, so your plants are breathtaking on the day they are installed! Annuals will bloom all season in your pots or containers with little upkeep. Depending on the weight and size of your pots, we also offer planted liners fitted to your pot size. Liners are made of a decomposable material. The newly-filled liners will simply be delivered & dropped into your pot in the Spring, and can be composted or disposed of at the end of the season.